It’s Booty Time on the reels of the Microgaming video slot, Captain Squawk`s Booty Time. 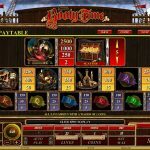 When you first see the slot name you are bound to get some nasty ideas, so seeing that this is actually a pirate slot may be a bit disappointing for some players. Still this is a very fun slot where the reels are set on the deck of a ship and you can hear soothing guitar sounds in the background as the reels spin. Captain Squawk`s Booty Time has an interesting bonus round which is triggered when three scatter symbols land on reels 1, 3 and 5. The player will get three free spins with an initial multiplier of x2. But don’t be disappointed, this is just the first level of the bonus round. You will also need to pick one coin from the Golden Coins presented on the screen. The number you get from the Golden Coin is the number of picks you will get in the next level. In the last level of the bonus round you will need to make picks among different Treasure Chests. The number of picks is determined by the Golden Coin earlier and you can get extra free spins and extra multipliers. So the end tally of the free spins and multipliers is always higher than what was initially awarded in the bonus round. 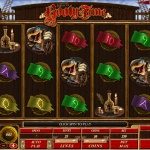 The designers from Microgaming put in a lot of work to make Captain Squawk`s Booty Time a visually attractive slot. All of the game symbols are native to the game and the visual effects are great. The free spins bonus is attractive thanks to the extra free spins and multipliers to be won, so players can hit big payouts during the free spins bonus. If you love island life then you should consider playing Big Kahuna a 5 reel slot by MicroGaming.